There's no such thing as a free lunch, right? 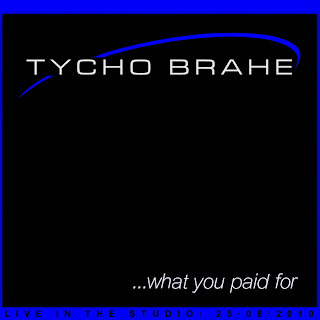 Well, maybe not, but something that definitely is free is the digital download only new EP from Tycho Brahe, "...what you paid for". Scheduled for digital release exclusively on CD Baby, "...what you paid for" was recorded live in the studio on 25th August 2010. The concept: place Tycho Brahe in a recording studio and have the band perform a selection of songs live, just as they would at a gig, so the live energy can be captured in a controlled environment for posterity. The reality: the same lack of control applies, and before we know it we're dealing with poor sound monitoring, equipment breakdowns, microphone spill and general confusion. The truth: You get what you paid for... We did. Did you? The five songs on the EP represent a couple of band favourites, a cover for a good friend, and some requests from the eternally patient long term die hard fans of Tycho. To you, we shout “Thankyou!” This is for you.